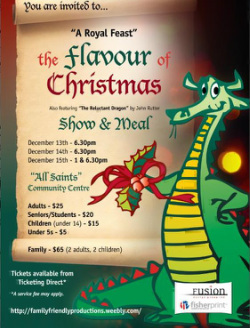 Family Friendly Productions second show "A Royal Feast: The Flavour of Christmas" took to the stage between December 13th and 15th 2012. The play was written by director, Nina Donkin, and secretary/stage manager Emily Good. It tells the story of King Harold's royal Christmas feast, and includes the audience as guests in this medieval court. The entertainment of the feast is all sorts of acts performed by members of the court, and we also performed John Rutter's "The Reluctant Dragon" playlet as entertainment. But all does not end as one expects, when the King's golden goblet is stolen. The play (excluding The Reluctant Dragon) can be purchased through the company, so please fill in a contact form on our contact page. We were privileged to have an amazing cast and crew to work with. Many thanks to Nina Donkin (director/choreographer), Debbie Donkin (musical director), Emily Good (stage manager) and Nicole Ferma (choreographer) for their hard work.